The Oregon Ducks have been set up with what has been called a soft schedule. Many believe these games aren’t giving the fans a chance to see what the team can really do. Looking back at their first game of the season against Bowling Green when they won 58-24, I agree with the statement or even when they played Portland State. However, Saturday’s game provided us with some amazing plays by both the Ducks and San Jose State. The Ducks would push, and the Spartans were right there to push back, and push back hard I might add. This was the best game of the season so far. Note worthy plays for the day would include the 38-yard throw from Josh Love to Tre Hartley. I think the Spartans surprised themselves after a field-goal block, after which we see the Spartans celebrating as if they scored a goal. At the end of the 2nd, Johnson Crawford scored a touchdown ending the quarter 21-6. 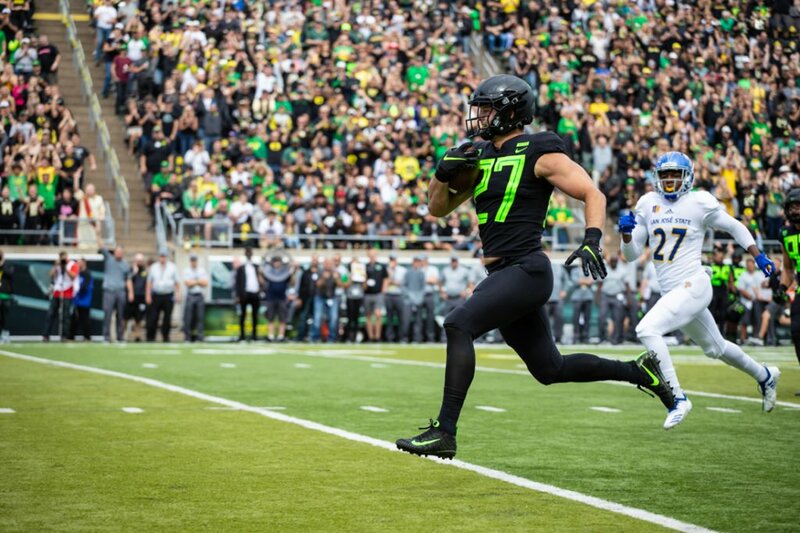 The absolute worst play of Saturday’s game must be when Oregon’s Austin Faoliu pushed San Jose’s Aaron Jr. well after he relinquished the ball to another player. In my opinion unsportsmanlike conduct and not something I want to see from my Ducks ever. This action caused a flag on the play and the Ducks had to miss out on the amazing interception from Jevon Holland. I am truly saddened and disappointed in the actions of Austin Fauliu. I was so excited when I first heard about the non-conference games, I thought great we will see the Ducks being pushed. I felt they had done all they could against the conference teams and weren’t being pushed anymore. The first two games of this season weren’t much better. This Saturday, the Ducks play against the Stanford Cardinals. The question on everyone’s mind is will they lose against Stanford again or will they win. Looking back over the years is no way to be able to pin point that answer. If we look back just at the last two years, then I have to say they will lose as they have in the past. There have been other years when the Ducks did an amazing job against Stanford and won. We can’t even say well Mario Cristobal will lead them to victory based on past performance, didn’t join the team until after they played Stanford last year. One of the biggest battles of the season is this Saturday who will be the winning team, the Ducks or the Cardinals. Naturally yours truly will be watching the game with bated breath. Of course, I will be rooting for my team the Oregon Ducks. I hope Mario Cristobal will take the Ducks to his first victory against the Cardinals making it a 4-0 wins.